Those present were also introduced to Community Capacity Enhancement which will involve them in community dialogues in order to discuss issues and develop solutions to them. The HIV/AIDS Directorate from Vryheid DoE office also addressed the community and learners about issues of teenage pregnancy and HIV infection and the support that they should give to their children. 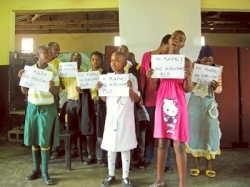 Learners performed a drama on the importance of avoiding early pregnancy and consequences of teenage pregnancy, as well as songs, poems and traditional dance related to child protection. In addition to the child protection focus, different government department officials delivered talks and explained services they provide before offering them then and there: the Department of Agriculture provided free seeds to people who had brought their IDs along, the Department of Health attended to people suffering from various ailments, and Home Affairs processed 39 IDs. The activity day as a whole strengthened multisectoral collaboration around child protection and also boosted learner participation by allowing them to express their feelings about their rights in different ways.